W okresie wakacyjnym realizacja sandałów trwa około 3 tygodni (15 dni roboczych). Czas uzależniony jest od liczby zamówień. - ideal for forest tracks, gravel and asphalt roads. Monte Silentii are dedicated to running. 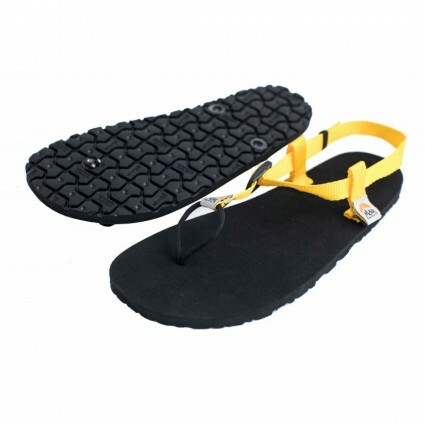 Sandals fitted with threaded Vibram sole 10mm thick ideal for forest tracks, gravel and asphalt roads. The binding system of Monte Silentii makes it ideal for running. Vibram - renowned Italian company who is well known around the world, produces soles for shoes with the highest quality. Because of properties of soles (like strength and adhesiveness) Italian's company has got great popularity. Vibram's soles is used for production most of the mountain's shoes. Strap is made of polypropylene which is very high resistance to tearing and friction. Stamina of the strap is about 620 lb (280kg). Strap is made in Poland. Self-locking buckles are made by renowned American company ITW NEXUS. This company has been working at plastic buckles for 25 years, which is graet guarantee of the best quality of the product. Innovative solution of the binding system. It's very simple and similar to type used in traditional sandals but because of soft and flexible straps connected to self-locking buckle, this makes regulations fast and easy straight to foot shape. All production is a handmade, from the beginning as cutting soles in correct size and shape up to the end like sewing straps and trade marks. Because of great care and handmade style of production, this makes pare of MonkSandals as a unique. Vibram soles is connected to the straps by high-strength rivets. This makes the connections are very solid. Because of this system You don't have to warry about separation straps from the soles.